Happy Saturday friends! Hope y'all are having a great weekend so far. 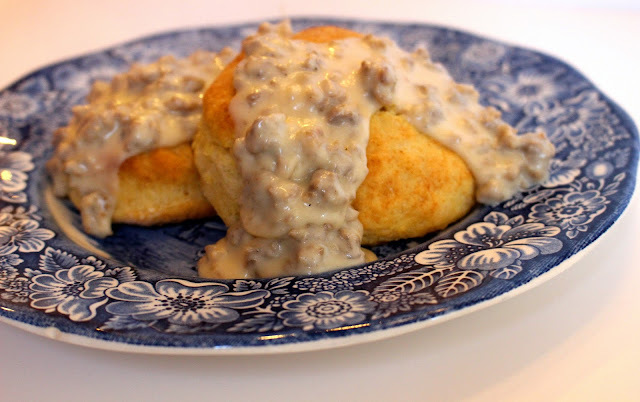 Before I went to work this morning, I decided to wake up a bit early to bake y'all some homemade southern biscuits and gravy. Now don't be fooled. This may be the most non-photogenic food ever but it is a southern staple and a taste of heaven. I mean look at these fluffy bites! This recipe makes 8 biscuits with enough gravy to generously cover each one. If you don't like gravy too much (then we can't be friends first of all..haha jk.. not really) then maybe cut the gravy recipe in half. Grab yourself some strong coffee, sweet company, and dive in my darlin! Start by preheating your over to 450 degrees F.
Cut your butter into small pieces. Then in a mixer or in a large bowl with a fork, add your flour. sugar, baking soda, baking powder, and salt. Then add the butter and mix until the batter looks like very fine crumbs. Create a well in the center of the batter and add your buttermilk. Stir to combine. Flour your surface (aka probably your kitchen counter) and turn to batter out of the bowl. Pat and fold the batter for a couple of minutes until it is in the shape of a rectangle and fairly thick. Use a biscuit cutter (or the top of a cup) to cut out circles of the batter for your biscuits. You can fold the left over batter together so you will be able to cut out more circles. Add the circles of batter close together on a parchment paper lined baking sheet. 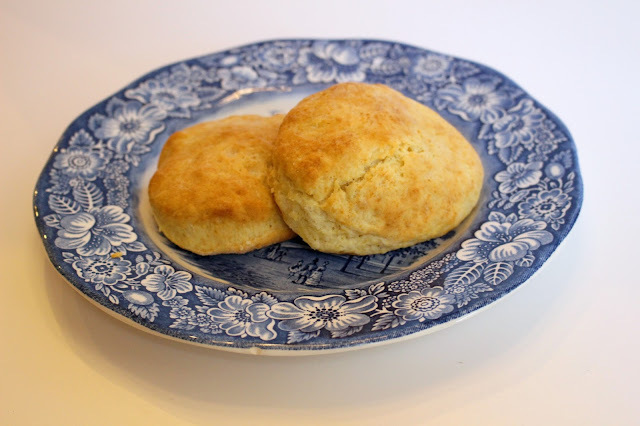 Once the biscuits are out of the over, brush the tops generously with melted butter. Brown your sausage in a large saucepan. Once it is completely browned add your flour and cook for a few seconds longer before adding in your milk. Once you have added your milk continue to stir for several minutes on medium-high heat. Once the gravy begins to thicken, add the rest of the seasoning. Pour over your hot biscuits straight out of the oven and prepare to blow your guests away. Have a great weekend ladies. Talk to you very soon!